Dictionary of Australian and New Guinean mammals. Artist/Author: Strahan, Ronald and Pamela Conder. A unified guide to the mammals of both Australia and Melanesia. Based on Ronald Strahan’s first dictionary of Australian mammals, published in 1981, it includes all species, both native and introduced, extant and believed extinct. For each species and genus, it gives a clear guide to pronunciation, the derivation and significance of the component parts of the name, and citations that identify its earliest valid description. 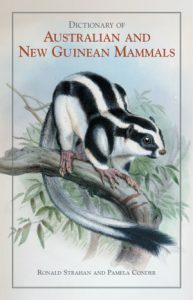 This unique work includes biographical notes on the 50 zoologists who, over the past three centuries, have been the principal contributors to the taxonomy of Australian and New Guinean mammals. The book also includes an account of the principles and practices of animal nomenclature, together with a comprehensive bibliography, and an index on common names.